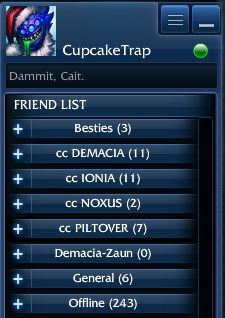 tl;dr: Go friend some Factioners from the List of Summoners and introduce yourself. We strongly encourage players to create matches. And I want to take a moment to thank everyone who’s taken the time to do so. Thank you all! Your efforts make it possible for everyone to enjoy playing in and watching Factions matches. I’d also like to highlight a few Summoners who’ve been particularly energetic about this: 501st Big Mike, Barnaby J0n3s, REDREX7, and x13spiral13x. But let’s not just thank them. Let’s help them out. We have a List of Summoners you can invite from. We have faction-specific chats (PILTOVER, BANDLE CITY, ZAUN, and DEMACIA) that match organizers can invite from. Summoners are encouraged to put their faction in their status so that you can just mouse over them to figure out their faction, rather than having to look them up. There’s another thing you can do to help out these intrepid match-creating Summoners, and to help you organize matches yourself more rapidly: find some friends. I encourage everyone to take a few minutes to flip through the Summoner List, add a few Summoners from your own faction and from other factions, and introduce yourself. It’d also help to have Faction: Zaun or whatever in my status line. which is really handy when putting a match together, especially if the owner of the game distributes invite powers so that everyone can fetch their own friends. It makes it easier for you to see how many people are on from which factions, if you’re thinking about starting a match. If you’re in a lobby that’s still seeking Summoners, you can help out by asking your own Factions friends to join in. ‹ New Lore Posted: Breakthrough!